from Printronix, the actual OEM manufacturer of the 6500. 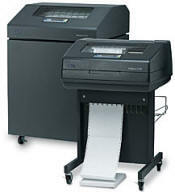 The InfoPrint brand of the 6500 line is only available as refurbished units only. The 6500 family of line matrix printers support multiple data streams: IPDS (Intelligent Printer Data Stream), Twinax/Coax SCS, Ethernet and ASCII. Users can choose from a variety of models and configurations to meet system and user requirements and applications. If system requirements change, users can select from an extensive array of options to support expanded requirements. IBMs 6500 printers offer a wide selection of optional features to provide the AS/400, iSeries and 3270 users ASCII, SCS or IPDS emulations to satisfy their needs. These are great replacements for existing older products such as the 4234, 5224 and 5225s or new printer requirements without concern. The optional IPDS, QMS or IGP graphics features options enable expanded print functions such as bar codes, forms overlays, and expanded characters to enhance printed output.